- or at (limited) direct sales events only. The mounts and pendants shown on this page combine a high degree of historical accuracy with a reasonable price. All these pieces are made of a modern lead free pewter (92% tin alloy). Each piece is individually cast in a hand carved soapstone mould, the same technique used by the ancient Celtic and Norse metal smiths. The designs range from adaptations of original artifacts to new designs based on historic styles. The specific source for each design is listed. 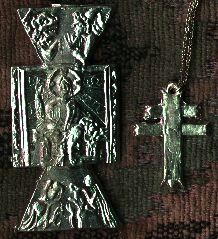 Pewter, when new, is very close to sterling silver in appearance, and was widely used by the middle class in the Middle Ages because of this. The shiny 'fresh out of the mould' finish duplicates the way these pieces would have looked when they were originally made. Because of the total lack of lead in this modern alloy, the metal will not tarnish with age as the old pewter does. Soapstone moulds, castings and equipment. Short cuts to individual design types. 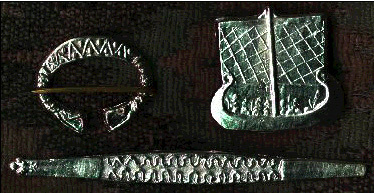 During the early middle ages belts and straps for equipment were often made of embroidered fabric or were tablet woven. To reinforce these bands at their ends, a small plaque was attached. The usual shape is that of a 'U', with the flat end attached to the strap. Historically there are three methods used to attach the mount to the strap. A single hole for a rivet would lend itself best to use with leather straps. A series of small holes along the base of the mount would be used with small pins (on leather) or with a heavy thread. In the last method the mount has a rectangular slot in one end that the strap would be looped through, a method most suitable for woven straps. The material that these mounts were made of ranged from wood and antler to precious metals. The simplest, such as those found in Viking Dublin, are of roughly shaped wood and are simply embellished with scratched patterns. Carved antler mounts are also common in Norse sites. Artifacts in each of these two materials clearly shows the Norse mania for carving decoration on everything! Cast metal mounts, in bronze, pewter, and other related alloys, were mass-produced for the middle class, and show a range of workmanship (undoubtedly this was reflected in the original price!). Such items were cast using reusable moulds, carved of antler or soapstone. Slightly more up-scale versions had the base metal covered by a layer of silver or gold guilt. Precious metal examples, in silver and gold, are also found. These are often set with semiprecious stones. The 'lost wax' method was employed to make such items, where the moulds have to be broken to remove the finished casting, and many mould fragments have been uncovered. The most ornate examples are those from the burial at Sutton Hoo. These are large gold castings, set with cloisonne garnets. Early examples of strap mounts, among the Angles and Saxons, are often an elongated leaf shape, fairly narrow and long. This material tends to have geometric designs. By the 900's the 'U' shaped mount was most common. Later the influence of the Carolingian's is seen in increased use of foliate patterns and pierced work. As can be guessed, the major difference between the mounts used by the individual groups can be found in the ornamentation. The Norse designs often contain gripping beasts and interlaced patterns, and are less likely to be symmetrical around a vertical centre line (as is the case with Anglo Saxon pieces). As well the Anglo Saxons and the Norse, the Franks made use of similar mounts. It was common for these mounts to be also used as jewellery, especially in the middle class. There are many examples that have been found pierced with rings that would have originally been strung on leather thongs. This practice was most commonly used with metal mounts cast of bronze or pewter. In several cases, gold artifacts have been found along with lower quality copies made of the less expensive metals. The following images were created by scanning the actual finished castings, and are shown approximately life sized. Designs shown here are (l to r): Celtic Broach, Celtic Beast, Bear's Claw, Celtic Wolfshead. 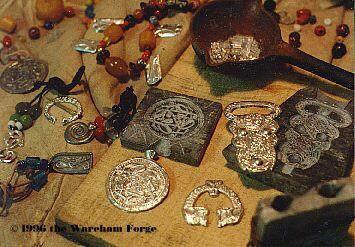 As well as strap mounts 'converted' into jewellery, the Wareham Forge offers a range of pendants based on Norse and Celtic designs. Each pendant comes strung on a leather lace strung with glass beads. Brightly coloured beads were a favourite of almost all ancient peoples. The vibrant colours that could be produced in glass were not available in any other material. For this reason, glass beads are commonly found in Early Mediaeval graves. The beads used for these reproductions are hand made using the same ancient techniques. The results are virtually indistinguishable from the artifact types. Types include solid colours, swirls and millifiori. Each pendant is strung with six beads, different types grouped by colour. If you wish to create a 'coin pendant' type of custom necklace, each pattern is also available as a plain mount - set with a jump ring. Some of the smaller patterns are available strung with a silver coloured fine chain, as indicated in the description. As well as the individual broach designs, some patterns are also produced with standard pin backs. This pattern was originally created as an award token for a Medieval re-creation group, patterned after a black bear claw. 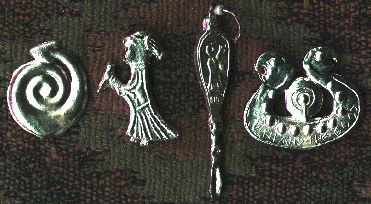 Designs shown here are (l to r): Celtic Mounts #1, #2, #3, Horse. This pattern uses one of the most common Celtic elements, the spiral. Interlocked spirals symbolized infinity to the ancient Celts. This design was inspired by Celtic bronze sword chapes (the tip of a scabbard). A large number of such pieces have been found throughout Britain. This pattern also uses the interlocked spiral, here three together, as well as a pierced knotwork panel. This pattern is based on a bridle mount design from the Celtic Bronze Age. Unusually, there are several existing samples: in gold (British Museum) and in bronze (Yorkshire Museum). The shape of this pattern is inspired by the designs found on early Celtic Bronze Age artifacts such as shields and bowls. 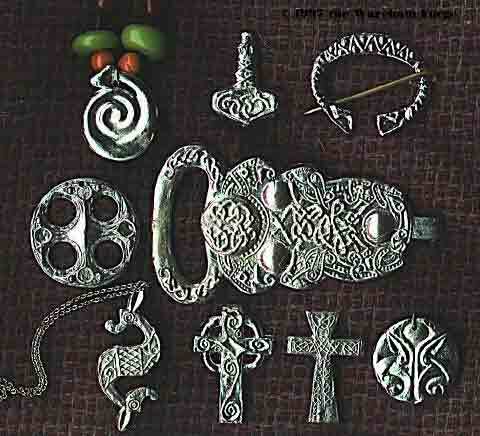 The serpent does not exist in Ireland, except within the lines of Celtic Art! Here three snakes lay intertwined, in a design from the 9th century Book of Kells. One of the most enduring motifs of the Viking Age is the eagle. This pattern is based on a bronze harness mount found in Gotland, Sweden. This strap mount bears the wolf, Fenrir, arch-enemy of Odin. This pattern is also in the Urnes decorative style. This pattern is based on an artifact found at the High Street site, Dublin, Ireland. The original is carved of wood and dates to mid 1000. A number of Norse sites have yielded serpent pendants, which are thought to have been good luck tokens.